Hello everyone and welcome to another post on this blog, I wish you had a happy weekend. The day before yesterday, I posted a new topic on the blog which was the 'Five-list' and talked about 5 things we should do before writing a blog post. Today, I got something different and it's not really new for me because I have done it before in my blogging journey, but this time I'm going to do it differently and hopefully, you guys will enjoy reading it. I'm going to start sharing apps that I use or I have used before in my life and I'm going to add this one on the blog as 'Apps time' which means its time for an app talk or discussion. Also, I'm going to share new apps on the store and give you a perspective on the new useful apps and maybe games in the future. I want to state that I own an iPhone if you are not here from the beginning of this year and I always owned an iPhone. I'm sure there are so many people own iPhones, but for the people who don't have it, I'm sorry if you can't find the app I talk about in the store. Let me mention something before we start, There are two platforms for most of the phones which are 'Apple' for iPhones and Apple products and 'Android' for the rest of the phones. Some companies make two version for both platforms which is amazing, but some companies don't which will not be good for those who can't get it on the store. However, I think we can find most of the big apps on both platforms nowadays. I'm not going to do full reviews for apps because that won't be interesting instead I'm going to talk about the app and share some of the features and my thoughts on it. The reason why I want to do this is that I want to help people to reach new apps they might be looking for or they want to know more about it. also, when I find a good app I will share it and who knows, maybe some people will find it good as well and it will be a helpful thing to do. 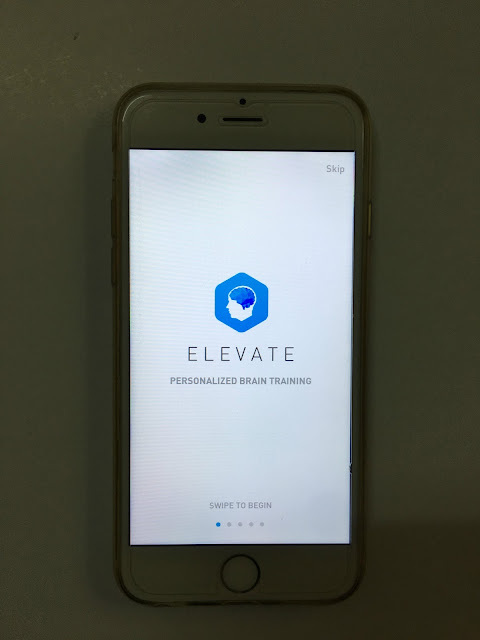 The first post on this topic will be about an app called 'elevate' and this app helps you to train your brain and improve focus, speaking abilities, processing speed, memory, math skills, and more. The app contains games or interesting things to do to be able to achieve what mentioned. There are so many things you will go through when you start using the app, but I'm going to share some of it and show you the concept of the app. This is the first thing you will see when start using the app and I downloaded the app again to show you what it looks like when first open it. 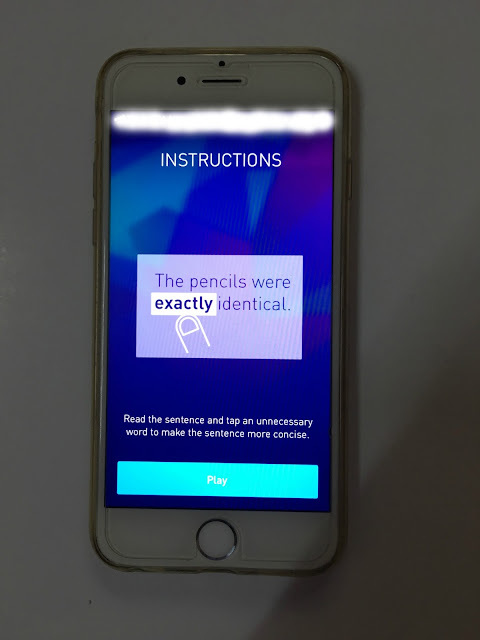 You will go through instructions on what this app contains and what you can do if you swipe to the right. You can track your performance in this app and show you how you doing by giving you an EPQ ranging from 0-5000 that represents your proficiency in each skill. You will be able to view this on the performance page on the inside of the app. If you have doubts about the games in the app, I would say you don't need to because all the games are developed by experts which means its good and trusted games. The last page of the instructions will be the beginning of everything which will help you to set up the app too. If you have used this app before, you don't need to go through anything except log in and go straight to the app. 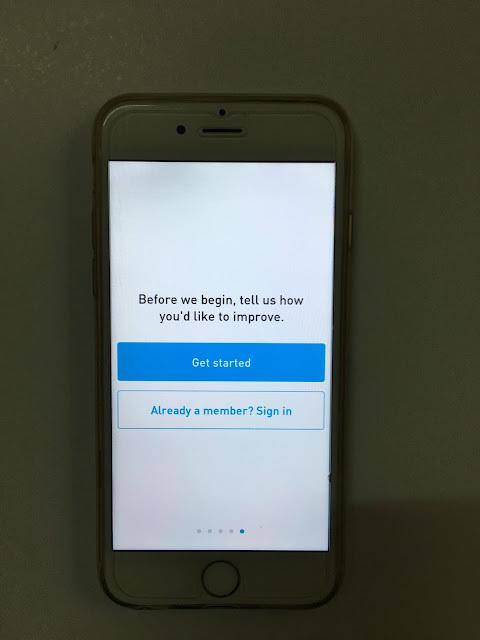 However, If You are new to the app, you will be given questions in order to set the app if you tap on the 'Get started' button. You can set up the app as you want and answer some questions to finish the process of setting it up. Also, you may need to create an account for you to use the app and when you get back, you will be asked to log in. This app can be used as free with limited games and you can purchase a subscription to get the full games and more. I want to state this in case someone wants to know about it. Also, You can try the pro version for 14 days. 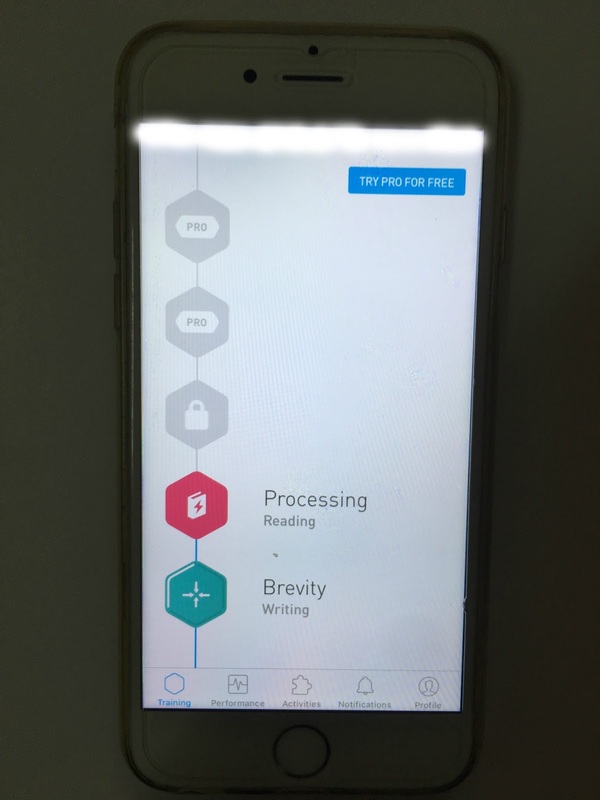 This is how it looks like from the inside of the app and as you can see in the picture above, there is like levels where you can take and once you finish it there will be information about your performance in the next page. Each level has specific games on a skill and the first one has the writing skill which we will be looking at. I have finished the first level which is brevity and I'm going to share a quick step to show you how this level works. Each level contains a bunch of games that you have to go through and then once the level completed, you will be taken to the next one. I don't have the pro version yet because I'm still practicing and I think getting the pro version would be a good idea which I'm going to do soon. If you visit the level for the first time you will be given instructions on how the level works and what is shown in above is instruction on how the first level works. You have to tap on the unnecessary words from a sentence and make sure to read it carefully because sometimes it's going to be tricky and you don't know. You can also know the recent achievements that you did in the app on the profile page which is amazing because you can keep track of it. I think we have reached the end of this post, but there is more stuff you can figure it out because as I said it will not be a full review for now. I hope this post will be good enough for you to get the app started and I hope that I did well on explaining the main points of it. Comment down below your thoughts on this app and other than that have a great day everyone! Thank you for sharing such an interesting app! I didn't know that something like this existed. Thanks for sharing such an informative post. I was not aware of the Elevate app. I will definitely look into getting it. These apps look like they would be absolutely fabulous to use on my phone! elevate sounds like an amazing app! I never heard of it before but I would like to give it a go! 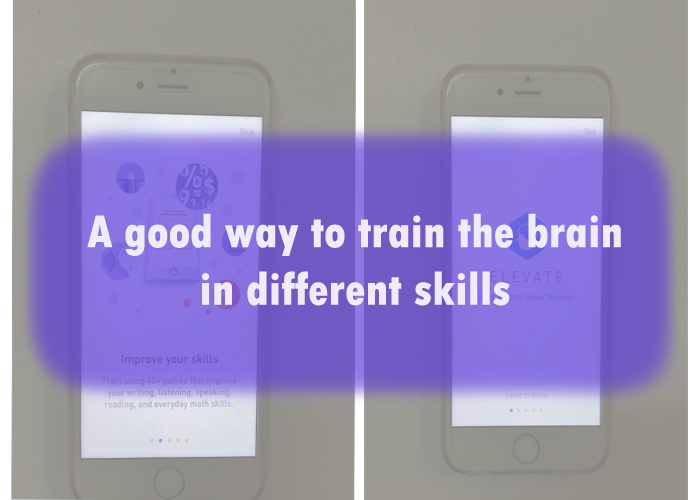 I think its very important to keep training our brain as we would with our bodies! Oh, I'm definitely going to check this out. It's so important to keep challenging your brain as you get older. That is pretty awesome! there are tons of apps like this bet I cant seem to find anything I enjoy. It's a very detailed review though not a full one. I'll try out this app. Thanks for sharing! This sounds like a really awesome app. I definitely would love to try something like this out! This is Great and I will have to check it out!